The process to restore the integrity and function of missing tooth structure that has been caused by caries or other external impacts is known as “Dental Restoration” or “Dental Filling”. To restore the functionality of tooth, dentists need to prepare the tooth to place restorative material and then place these materials in tooth or incline external material like veneers, crown or bridges on the damaged tooth to protect them from further decaying. The preparation involves steps such as cutting tooth with the help of hand-piece and dental burs so that there can be proper space for restorative materials to be filled in. Once the tooth is ready, it is filled with materials thus giving the tooth a fine structure with better functionality to bite and chew food. The prime materials involved in tooth filling are gold, amalgam, dental composites, porcelain or other relevant materials. The process of restoration can either be direct or indirect. In direct filling, the material is infused inside the damaged tooth whereas in indirect restoration veneers, crowns or bridges have been implied on base structure. The silver fillings are widely used in this process as it lasts longer and affordable. But nowadays, people are more inclined towards natural coloured filling as it gives the tooth its original look. In this method, malleable fillings is infused into the prepared tooth which is set hard afterwards and finally the tooth gets fixed firmly, stronger than before. The decision of which type of filling should be used depends upon the fact that at which part of the mouth the prepared tooth is located and the severity of the cavity. Post that, a limited amount of heat is passed through the tooth so that the filling gets set over there affixing the tooth. In this method, the process of restoration is done through external factors and fabrication is also done outside the mouth. Veneers, bridges and crowns are also involved in this method. These veneers, crowns and bridges are affixed with the help of dental cement. Indirect restorations are usually done with either gold or ceramics. Generally casting alloys are implied to prepare crowns and dentures. Besides this, 90% alloy of Titanium is also used as the anchor for dental implants. The process of filling one or more tooth doesn’t take much time nowadays. 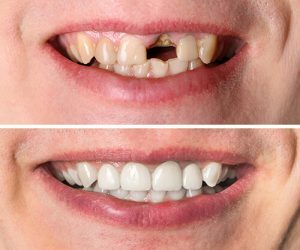 With the implementation of latest technologies and skilled specialists in the field, it is easy to get the damaged tooth restore its capability of biting and chewing by infusing right materials that don’t take much time get dried and hence the patient is free to go after a couple of hours. The choice of filling either depends upon the percentage of damage in tooth. But there are always varieties of materials for patients to choose and that too according to the allowance of their pocket. The coloured filling lasts for approximately five to seven years. Whereas silver and gold fillings tend to lasts for more than a decade. The materials used in the process of filling are available with different textures resembling with the shades of natural teeth and therefore gives a fine and natural look to your smile. It is hard to judge if a person actually had a dental restoration. If you are really looking for skilled and experienced specialist for dental restoration or filling, then you must visit to Dr. Mansi dental care center at Setellite Ahmedabad where you will be treated by skilled ones with all standard facilities and apparatus that are reliable and the cost is affordable.